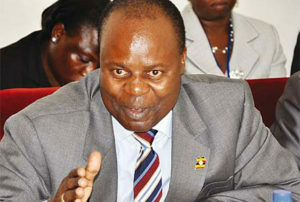 Bank of Uganda deputy governor Louis Kasekende. File photo. KAMPALA–After nearly three months of closure, Bank of Uganda has finally unfrozen the accounts of ActionAid, one of the non-governmental organizations accused of aiding opposition protests in the country and money laundering. “The leadership of ActionAid Uganda is pleased to inform its partners, supporters, and staff that our quest to have our bank accounts unfrozen has been achieved following constructive discussions with some agencies of government,” read a statement from ActionAid Uganda, issued Saturday evening. “We will, however, continue to seek restitution within the law, as we are entitled, in order to meet our own obligations to members, donors, and communities we serve. As we have stated before, there was no justification for the action taken against ActionAid when the police raided our office and confiscated property on September 20, 2017 and the subsequent order to freeze our Bank Accounts on 6th of October 2017,” read the statement in part. The BoU deputy governor, Dr Louis Kasakende, wrote to the Standard Chartered bank Managing Director on October 3, explaining that the Criminal Investigation Directorate (CID) of the police was investigating ActionAid International Uganda for alleged conspiracy to commit a felony and money laundering. He directed the bank to freeze the bank accounts Pursuant to section 110 of the Financial Institutions Act, 2004. “The accounts in question shall remain frozen until otherwise advised by Bank of Uganda,” read part of Kasekende’s letter. At the time, Arthur Larok, the country director, ActionAid Uganda described the move as unfortunate and erroneous. Police raided the ActionAid Uganda offices based in Kasanga in Kampala on September 21 and declared them a crime scene before conducting a search. The officers impounded computers, mobile phone handsets of staff and important documents as part of their investigations. Police conducted similar raids on the offices of Great Lakes Initiative for Strategic Studies (GLISS) and Uhuru Institute. The police raids came at the height of protests against plans by the ruling NRM party to repeal Article 102(b) of the constitution to scrap the presidential age limit. Parliament last week endorsed the age-limit bill. Police accused the organisations of funding illegal activities with the aim of destabilising government.